37.5mm 18K white gold case, onyx cabochon crown, 18K white gold bezel set with 60 brilliant-cut diamonds. 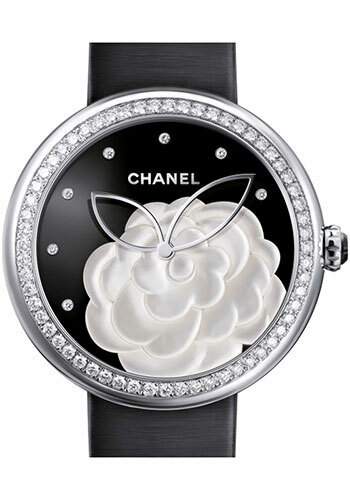 (~1.09 carats), black dial with a camellia in mother of pearl marquetry, 7 brilliant-cut diamond indicators, high-precision quartz movement with hours, minutes, satin strap, ardillon buckle in white gold. 37.5mm 18K white gold case, onyx cabochon crown, 18K white gold bezel set with 60 brilliant-cut diamonds. (~1.09 carats), black dial with 19 brilliant-cut diamonds, high-precision quartz movement with hours, minutes, satin strap, ardillon buckle in white gold.